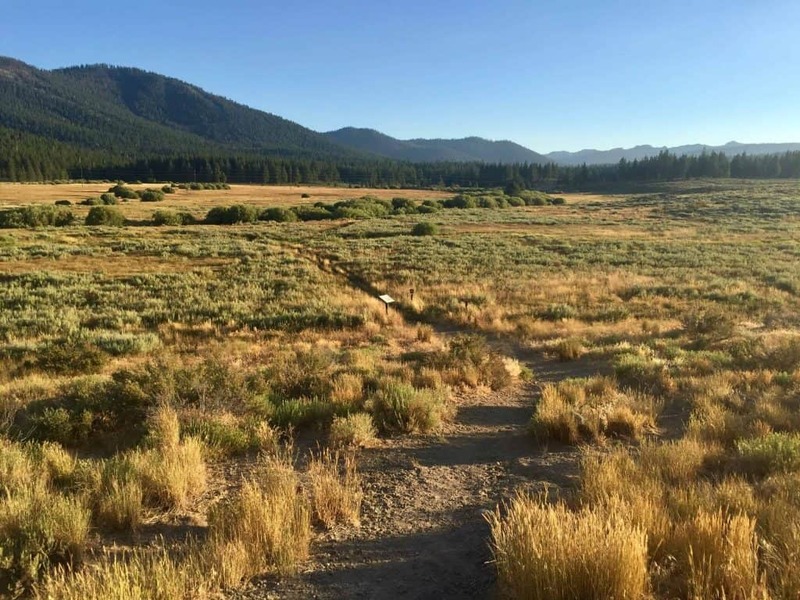 The Martis Valley Loop Trail has spectacular mountain views and is relatively flat for Tahoe. 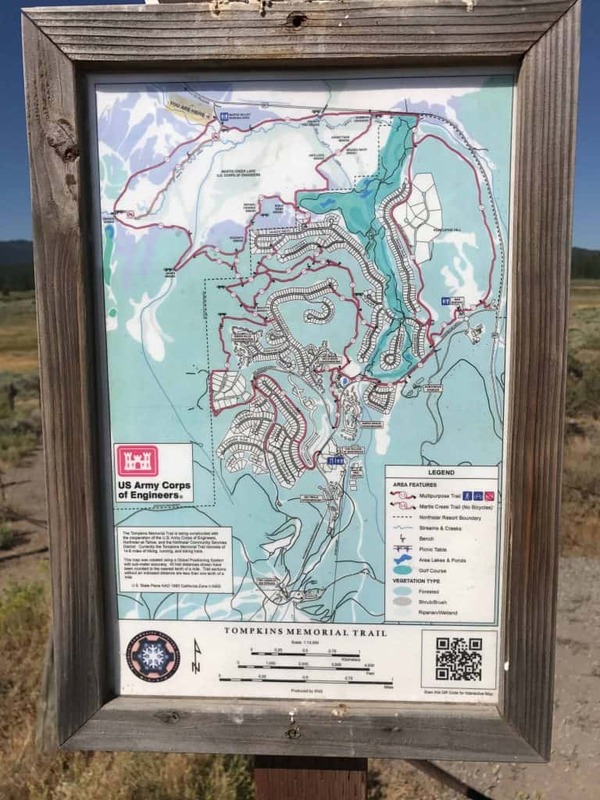 This is a great trail for running especially if you aren’t used to the altitude or want to run with a friend while chatting and it’s a perfect family hike. 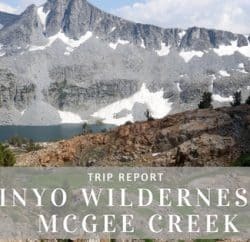 Take young kids to get them excited about hiking and families from out of town. 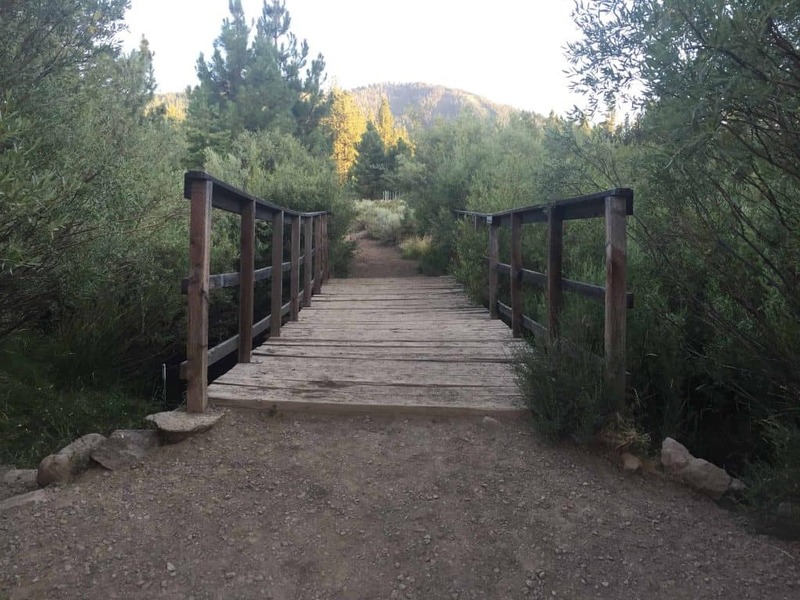 You can run it, hike it or bike along the outer loop called Tompkins Trail. It’s one of the first trails to melt out in the spring and a perfect place to check out fall colors. There’s a lot of water for dogs, some picnic tables to stop and enjoy lunch, and bridges and boardwalks that make it fun and interesting. 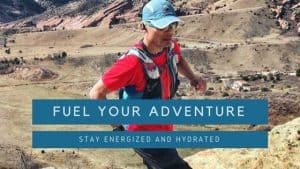 It’s also great for locals like me who want to get in a quick run after work or chat with a friend on a hike. It doesn’t have a ton of shade so I don’t recommend going it in the middle of a really hot day, but that’s just my preference. The light in the valley is fantastic early morning or at sunset so try to hit it at one of those times. 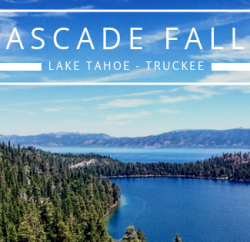 Getting there: From I-80, take the exit for 267 towards Lake Tahoe. 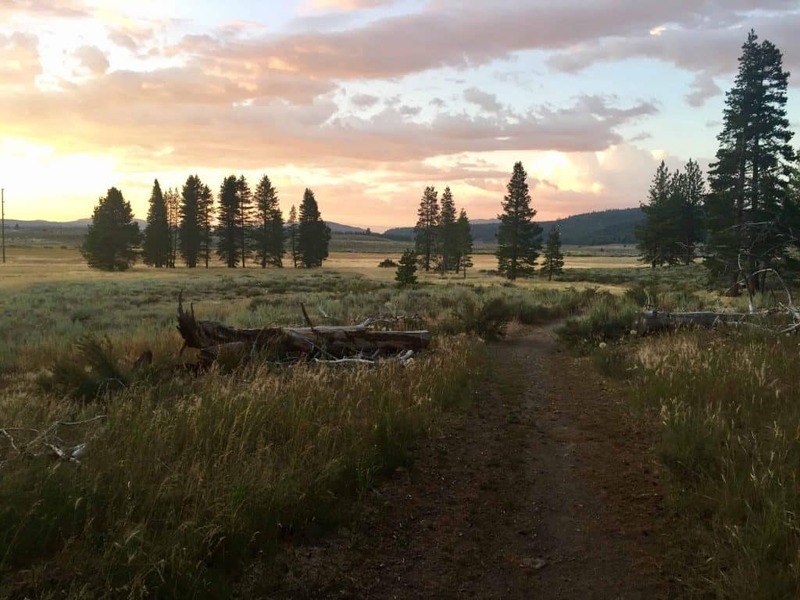 Continue for about 2.5 miles and look for a sign labeled Martis Creek Wildlife Area on the right hand side of the road. 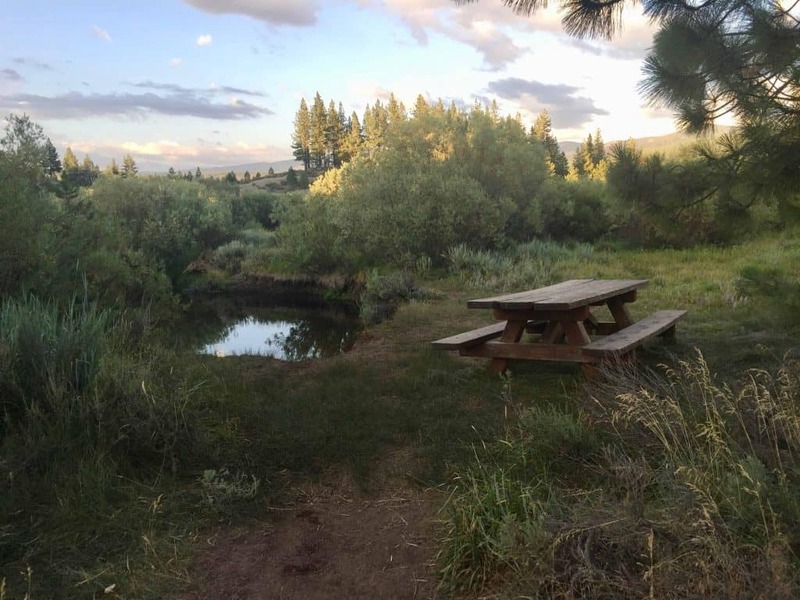 From Kings Beach or Northstar take 267 towards I-80 and look for the sign for Martis Creek Wildlife Area on your left. 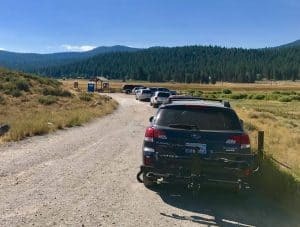 Parking: There are two dirt parking lots – one right as you turn off of the highway and a second down the dirt road about a tenth of a mile. There is a gate which is sometimes closed and blocks access to the lower lot. You can start by going either direction, clockwise or counter clockwise. I usually go counter clockwise although not for any particular reason. The trail is well marked including a map at the start and a few other maps along the loop. 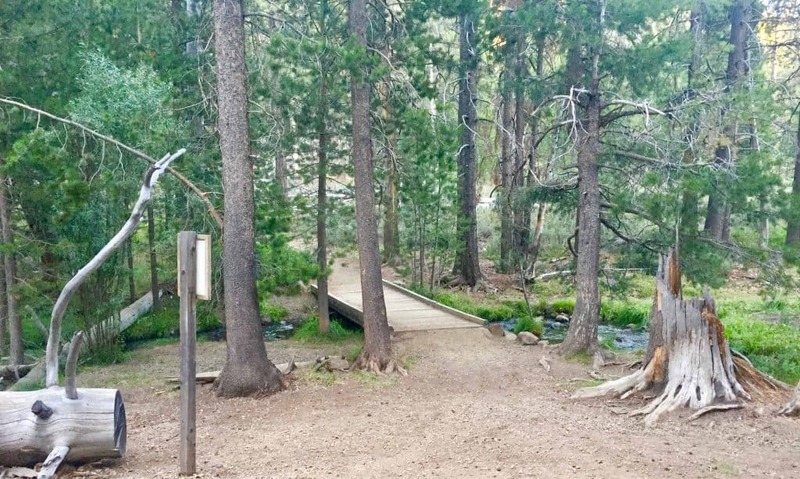 There are many options to add on to this trail by running or hiking up to Northstar. See the map above for options. 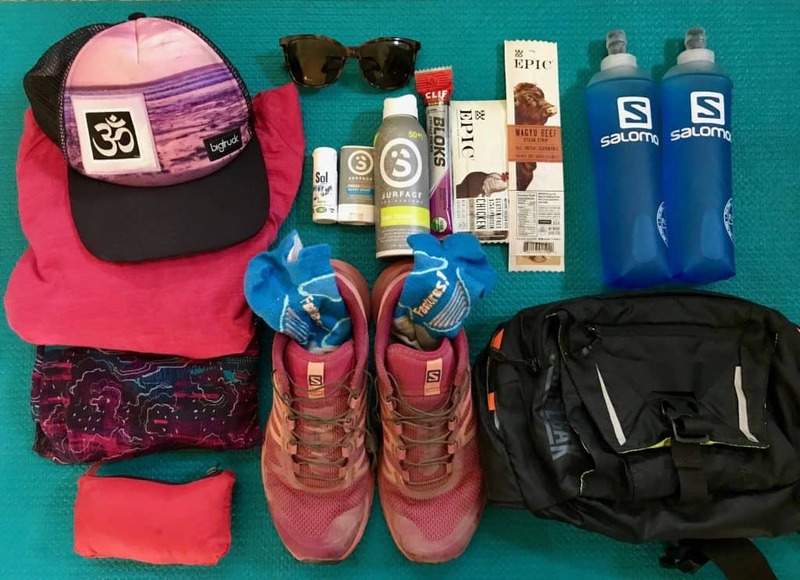 Going counter clockwise takes you through rugged shrubbery, tall grasses and along a meandering mountain stream up and over a small hill along a boardwalk to a bridge crossing. There’s a picnic table just past the bridge if you want to stop for lunch, I didn’t check the milage to this point but my guess is just under 1 mile. These pictures are from mid-summer at sunset. The start of the trail going counter clockwise. Here’s the same boardwalk in April 2017 after a big snow year! 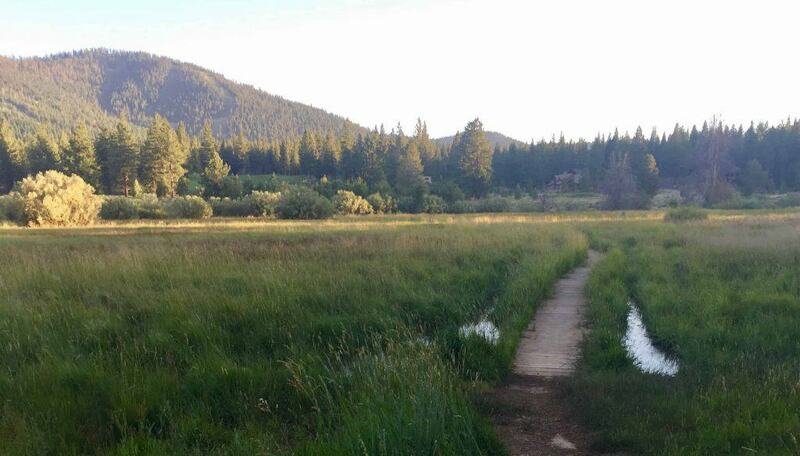 Keep an eye out for wildlife, Martis Valley is prime habitat for breeding birds. The main season is May 1- July 15 when birds from afar to nest here. Please don’t let your dog chase the birds or disturb their nests. 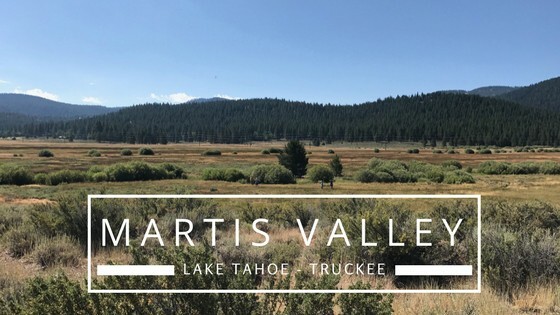 Martis Valley has a long history starting with the Washoe tribe settling here for the summers followed by lumbermen, cattlemen and sheep herders. 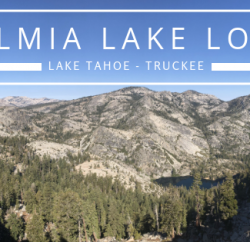 As you travel along the trail you will be rewarded with 360 degree mountain views including Northstar, Donner Summit and Mount Rose Wilderness off in the distance. Sunset runs feature lovely shades of pink, orange and purple reflecting off the snow peaked Sierra and Carson ranges that surround the valley. 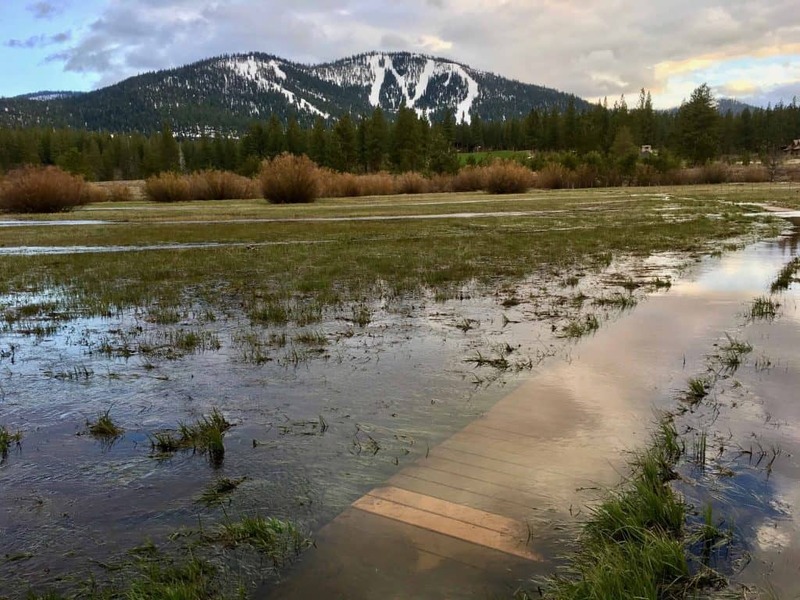 There is very little change in elevation, which is a welcome change for runners used to the severe terrain of other runs in the Truckee-Tahoe area. The trail continues to wind along the edge of the river and trees until it goes up another little hill and to the next bridge crossing. This is about the half way point. At this point the trail starts to veer away from the river towards the golf course and past some houses. You’ll go through a gate and continue along the golf course until you get to some more boardwalks. 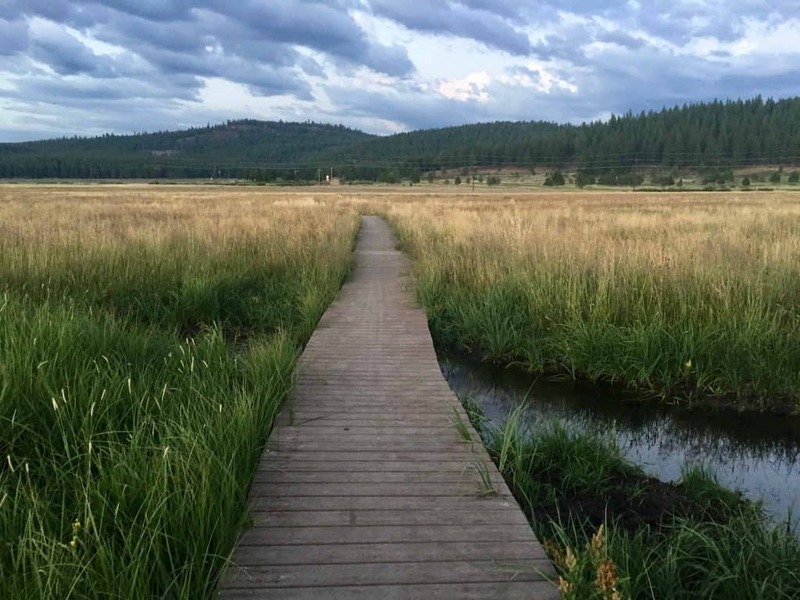 The boardwalk will lead you back towards hwy 267. After the boardwalk you have about a mile to go back to your car and the parking area. 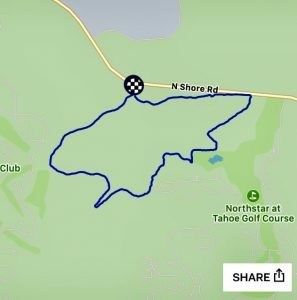 Look over at Northstar and out towards Donner Summit as you reflect on this amazing, fun trail! Map of the my route. 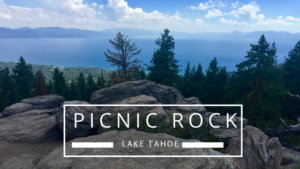 Check out our blog for more information on Lake Tahoe and Truckee Trail Running and Hiking Trails.